A disaster occurred the Keir household last month – I let the drinks cabinet run out of Kahlua! I should explain this idiosyncrasy A white Russian is my husbands favourite drink for winding down, and although we don’t drink that much (no really, despite all the homemade wine), his little weekend cocktail keeps him happy. I think it is partially due to feeling more like ‘The Dude’ a.k.a. Jeff Bridges in ‘The Big Lebowski’, though personally I think the cat would be a better Jeff Bridge dude double. 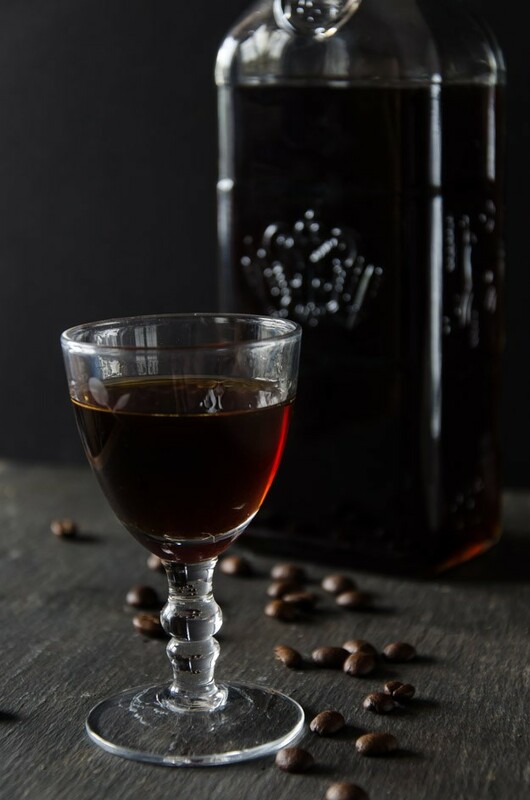 Although this recipe is not a quick fix for absent Kahlua, it was easier than battling through the supermarket AND it is infinitely customisable – more sugar/less sugar/more vanilla etc, no problem. 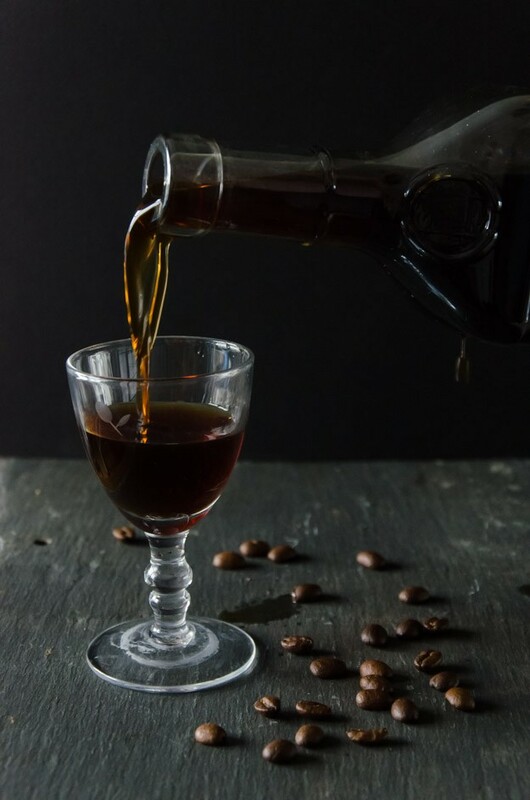 Just use this ‘recipe’ as a guide and experiment in liqueur making. Non-perfect concoctions are still drinkable and can still be modified if found lacking. In a large jar with a well fitting lid and wide top. I used an IKEA Korken jar which has a flip up lid with rubber seal (like a Kilner jar but much cheaper). Place all the ingredients into the jar and shake. Shake the jar daily for a week, weekly for a month then leave to steep for a month or two more. I recommend tasting it before getting to this stage to check the sugar levels etc. When deemed ready, or required, strain the liquid through a fine muslin or clean/new pair of tights into a clean bottle with a stopper. After watching ‘The Great British Bake Off’ and lamenting the end of the current series, I decided to challenge myself to make something something from the series that I hadn’t attempted before. My husband always chuckles at me when we watch GGBO because I tend to make comments like ‘that’s wrong’, ‘that’s going to fail’, ‘I wouldn’t do it like that’ etc. However I don’t think anyone in the real world would make their own filo pastry – that is what machines with big rollers are for! On our honeymoon on Crete we did watch an eighty-odd year old man make and stretch filo pastry by hand over a huge wooden table in his bakery and it was a joy to behold. Anyone else though, just go to the supermarket! 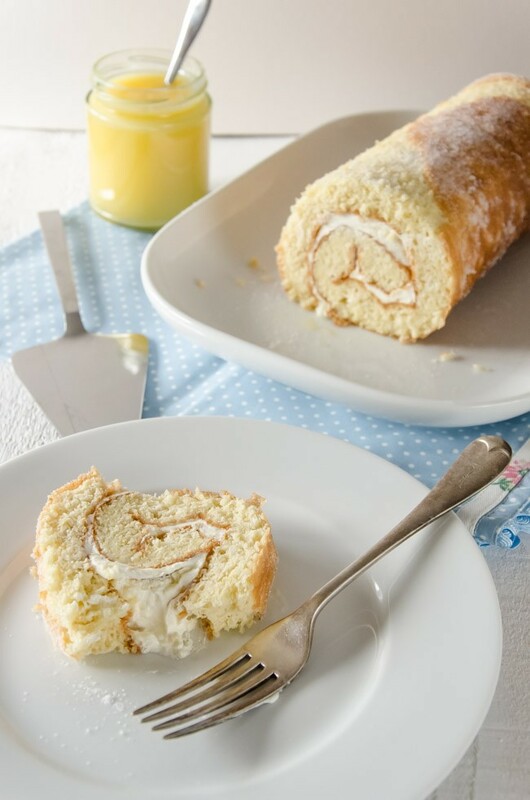 But back to the task in hand, in other words the Swiss roll. I have to admit that even I, a keen baker, has never made a Swiss roll before. Why, when Marks and Spencer make a perfectly good one in all yummy flavours. Well, I can tell you now (after the cake is made and entirely eaten) that homemade always tastes best; soft, moist and no nasty chemicals to make it stay that way for multiple weeks on a supermarket shelf! Have a go yourself. This recipe is from ‘Merry Berry’s Ultimate Cake Book’ from BBC books. It worked great and I achieved that nice tight spiral – Mary Berry would be proud! Only thing wrong is that it stuck to the parchment paper as it cooled, despite generous liberations of caster sugar, so the skin partially peeled off. I fear I would of been marked down because of that. Preheat the oven to 220 ºC/fan 200 ºC. Line a 33 x 23 cm Swiss roll tin (I used a roasting tin of the same measurements) with baking parchment. Whisk the eggs, sugar and lemon rind in a large bowl until the ribbon stage (took me about 10 minutes with my hand mixer). Sift over the flour and then carefully fold in . Pour the mixture into the prepared tin and tip the tin so that the cake mix is evenly spread and reaches the corners. Bake in the preheated oven for about 10 minutes until the sponge is light golden in colour and beginning to shrink away from the edges of the tin, but be careful not to overcook otherwise it will dry out ande be impossible to roll. Place a piece of baking parchment a little bigger than the size of the tin on the work top over a tea towel. Sprinkle the paper with caster sugar. Invert the cake on to the paper while still warm, remove the paper it was baked in, trim off the edges (a cooks perk – you get to taste it first) and score a mark 2 cm from the shorter edge, but do not cut all the way through. Roll up the cake firmly from the cut end and leave to cool rolled up. Only fill when completely cool. 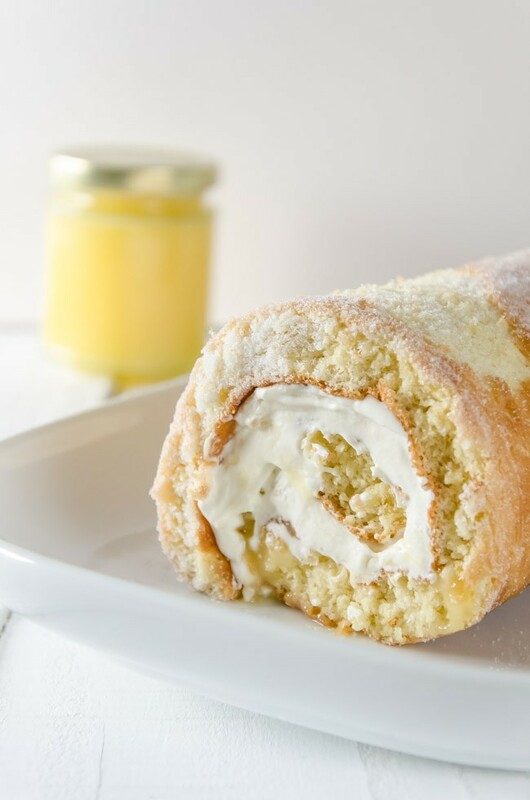 Unroll, spread with the lemon curd then the cream and roll up tightly again. Sit on the serving dish with the seam side downwards. While clearing out the freezer to make space for this autumn’s harvest, I came across a couple of bags of stewed damsons from last year’s gut. 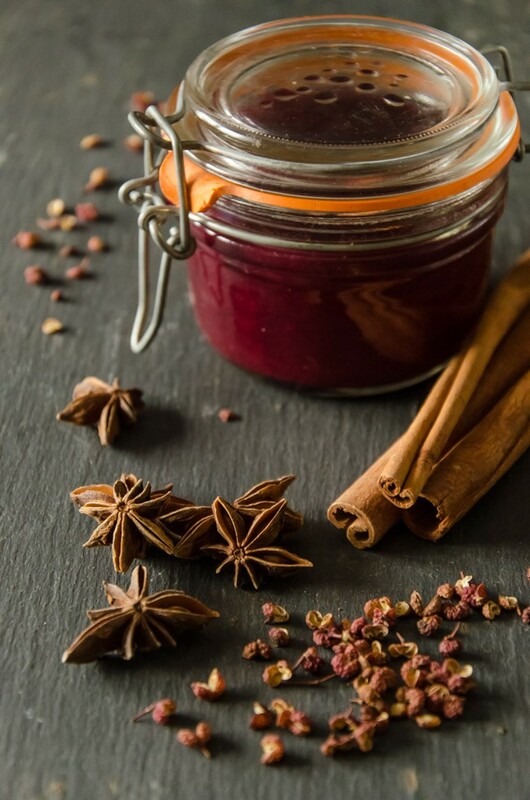 While racking my brain for some more unusual damson recipes, I did a Google search and found this recipe on Love and Olive Oil. The recipe was in typical American inaccurate slash annoying cup measurements and lacked any spices so I measured and added some spices and this is what I came up with. I am totally smitten with deep plumy red colour. It tastes like a cross between a fruity HP sauce (mmmmm, my favourite chip sauce) and a less spiced chutney. Apart from chips, I will be trying it with grilled dark meats and especially venison steaks. I need a trip to the supermarket then. Again. 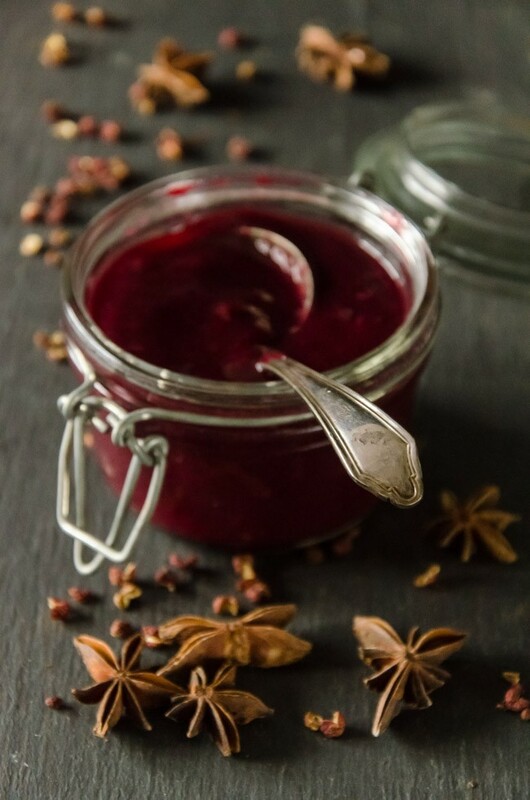 Place the damsons in a large saucepan and add 100ml water. Cook for 15-20 minutes until very soft. Allow to cool a little then, wearing rubber gloves, pick out the stones. Alternatively, press the stewed damsons through a sieve and discard the stones. In the large pan with the de-stoned damsons, add the rest of the ingredients and bring to the boil. Simmer gently for about an hour, stirring frequently so the bottom doesn’t catch, until the sauce is thick and syrupy. 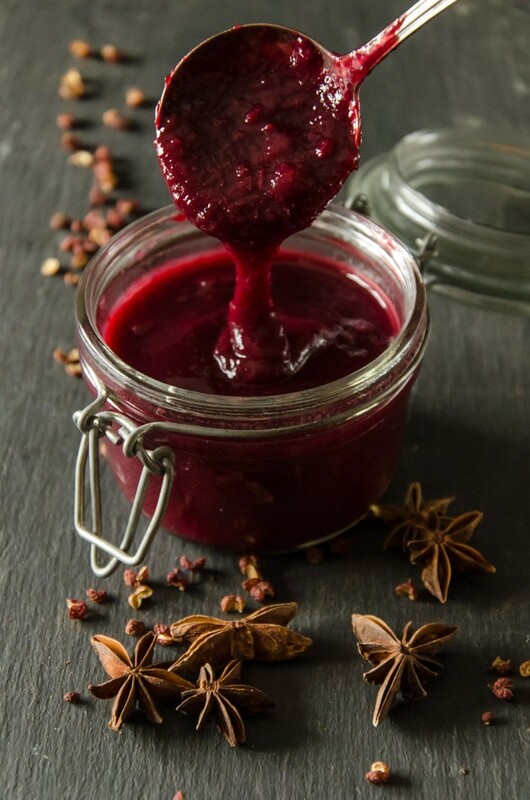 It is not like a chutney so do not expect to be able to draw a line through it. Sterilise some small jars with vinegar proof lids. Using a funnel, fill the warm sterilised jars to within half a centimeter of the top of the jar and tighten the lids. Leave to cool entirely before labelling. Store for a couple of months before using and once a jar is open, store in the fridge and use within a month. 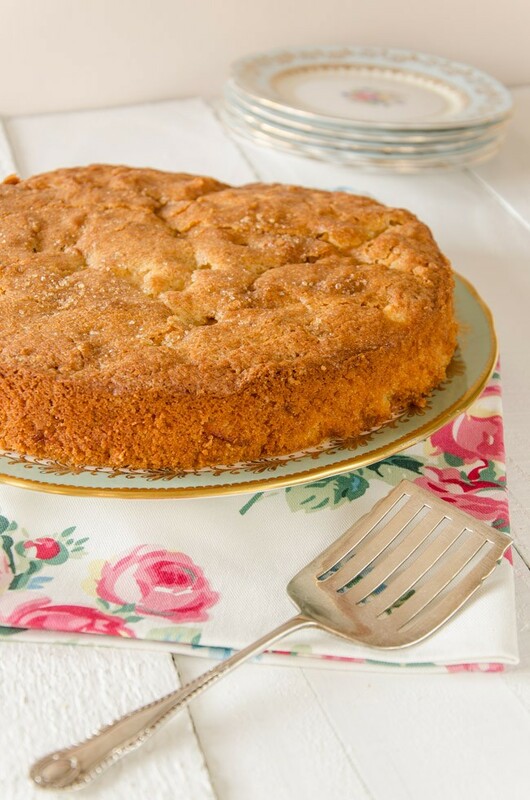 This recipe makes wonderful use of the windfall apples that are plentiful at this time of year. These are apples that are ugly with blemishes, or slightly bruised from falling off or being picked, and not suitable for storage. I made this recipe with apples I picked from a hedgerow tree which is on my drive to work. The apples are crisp, juicy and sweet and very similar to a Golden Delicious but not at all fluffy in texture like the worst of the ones in the supermarket. 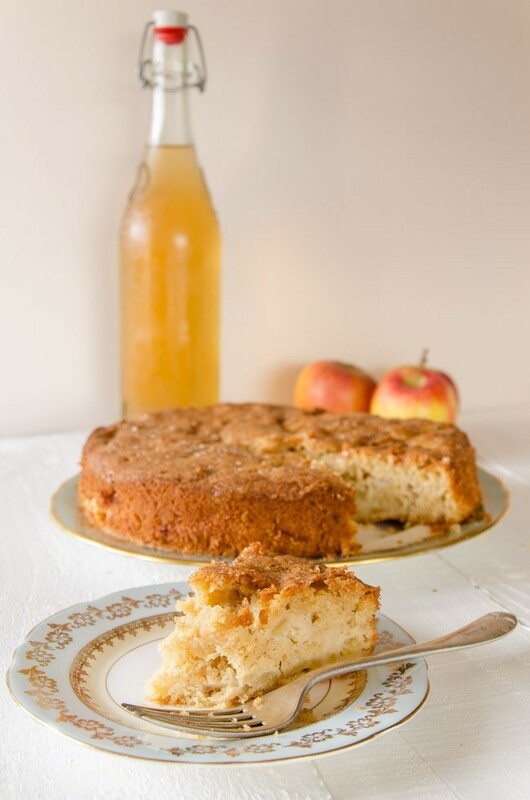 Unfortunately we didn’t gather enough this year for it to be worth making cider so I used some of last years very fine cider to add to this cake. Everywhere was telling me that this was a bumper year for apples; it wasn’t for me. We have 5 bottles of last year’s cider left so when they are drunk (and always savoured), I will have to resort to buying some. Oh well, hopefully I can find a local supply of Mill Whites Rum Cask cider – lovely! 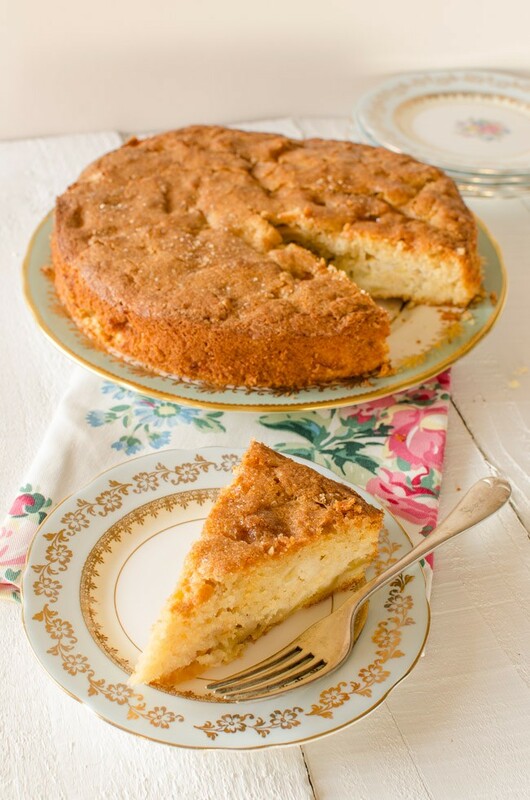 This recipe is taken from ‘The Great British Book of Baking’ by Linda Collister. This cake doesn’t keep very well because it is very moist so eat up! It is absolutely delicious warm, served with cream/custard/ice cream or all three if you are of that persuasion. The lovely appley chunks are counter balanced by the tang of the cider in the background – you are going to love it! Grease a 23cm springform tin and line the base with greaseproof paper. Preheat the oven to 180 ºC/ fan 160 ºC. Cream the butter and sugar in a large bowl until light and fluffy. Beat the eggs and add gradually to this. If it looks like it is curdling then add a spoonful of the flour. Sift over the rest of the flour and fold in gently. Add the cider and apples and mix well until thoroughly combined. Spoon the mixture into the prepared tin, level the top and sprinkle over the demerara sugar or flaked almonds. Bake in the preheated oven for 45 minutes to an hour – it is ready when a skewer comes out clean. Cool in the tin for 10-15 minutes then completely cool on a wire rack or eat while warm. I always have lemons in my fruit bowl. Their zest and/or juice flavours and complements a huge range of dishes from around the world, sweet or savoury. 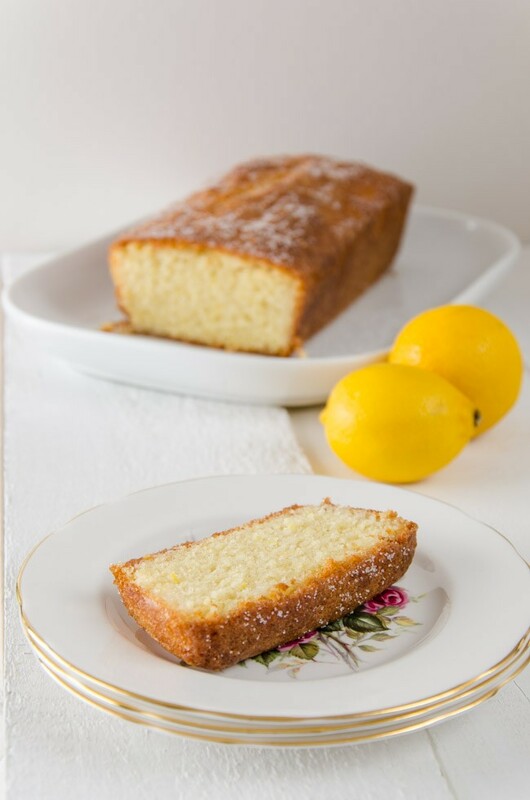 You can probably tell from the number of lemon recipes on this blog that I am a lemon fan. 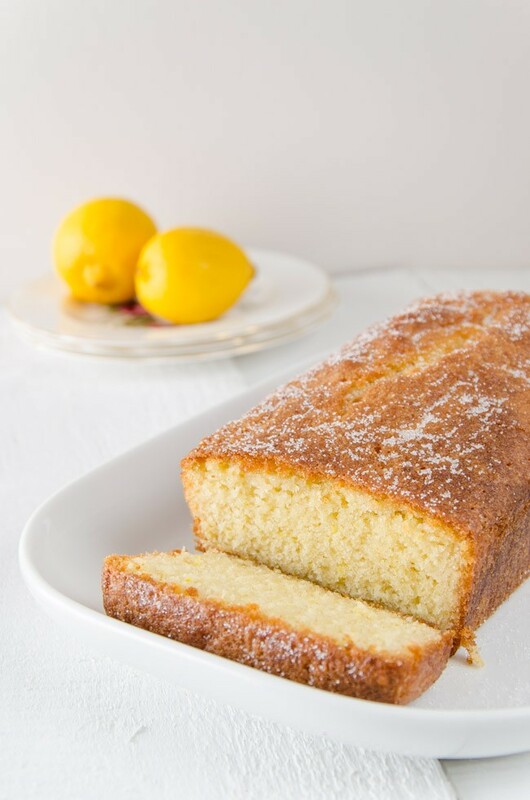 Added to a simple sponge mixture, the zest lifts the cake to heavenly levels and a lemon juice and sugar drizzle ensures the cake is always moist to the last slice with a scrumptious crunchy sugar crust. Plus I enjoy looking at their sunny brightness in the fruit bowl. I can’t remember where this recipe came from; it is hand written in my recipe collection book in amongst other recipes written when I was a student. I am sure it is the kind of recipe found on the side of a bag of flour or tub of baking powder. And it is so simple, it can be put together while cooking ‘proper’ dinner, not that I against having cake for dinner! Set the oven to 180 ºC/fan 160 ºC. Grease and line a 2lb loaf tin. Cream the margarine and sugar until light and fluffy. Crack the eggs over the top and sift over the flour, salt and baking powder. Add the lemon rind and milk. On low speed with a hand mixer, mix until well mixed but do the last bit by hand to ensure it is not over mixed. Pour in the prepared tin, smooth the top and bake in the preheated oven for 40-45 minutes until firm and an inserted skewer comes out clean. Mix the syrup ingredients together and pour over the cake as soon as it comes out of the oven and is still warm. Leave to cool totally in the tin. This is a recipe that I made way back when it was still summer but some how got shunted down the list of blog articles, lost in time. Until now. Have I ever mentioned that cherries are my favourite fruit? Well you know now; they are. I don’t mind how they come and even artificial cherry flavourings and sweeties are fine by me. Tart sour dried cherries have got to be my absolute favourite but since finding them in Seattle, I have not found any in this country that are quite as sour and tangy. Anyone found any? I am willing to be a taster for them! Recipe adapted from Raymond Blanc ‘Foolproof French Cookery’. 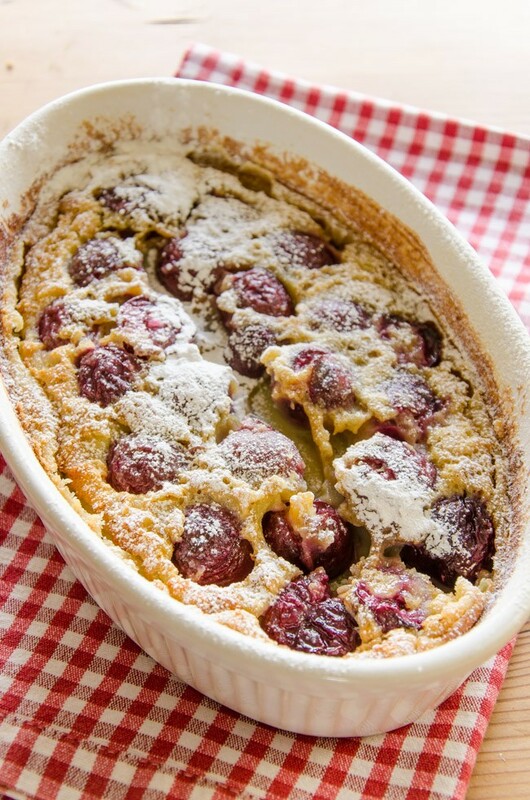 You can substitute other fruit for the cherries – I made a very tasty fig clafouti last weekend (substitute almond essence for the vanilla extract). 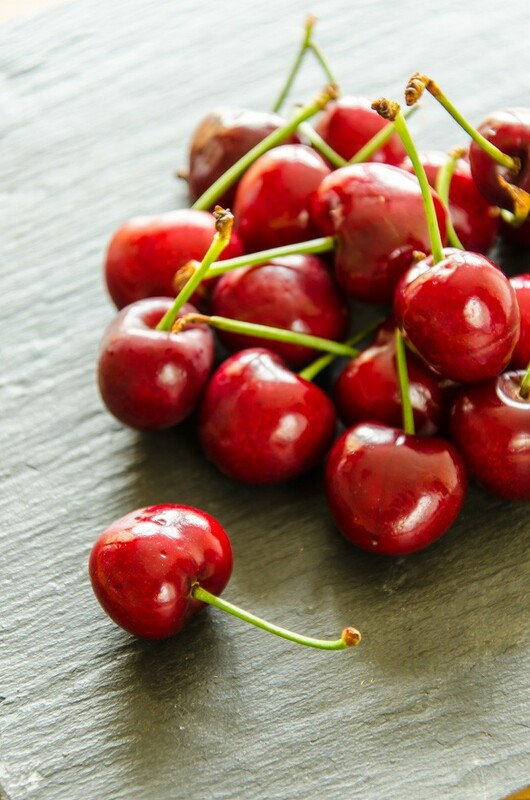 Mix the cherries with the sugar and kirsch and set aside for a couple of hours for the flavours to intensify. Prepare the baking dish (china or cast iron, about 20cm diameter, 5cm deep) by rubbing generously with butter and then sprinkling in some caster sugar to form a lovely crush on the clafouti. Preheat the oven to 180 ºC/fan 160 ºC. Make the batter by putting the flour and salt in a large bowl, make a well in the centre and add the eggs, sugar and vanilla. With a whisk, slowly incorporate the flour into the egg mixture until smooth. Pour in the milk/cream. Alternatively use a hand blender to mix. Melt the butter (microwave is easiest) and then beat into the batter. Mix the cherries and any juices into the batter and pour the whole lot into the baking dish. Bake for 30-35 minutes until just set. Serve warm or cool but not hot or ice cold from the fridge.